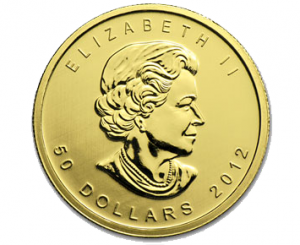 The Canadian Gold Maple Leaf is the official gold bullion coin of Canada. This 99.99% pure gold coin was introduced in 1979. At the time, it was the only internationally-recognized gold bullion coin apart from the 22 karat South African Krugerrand. 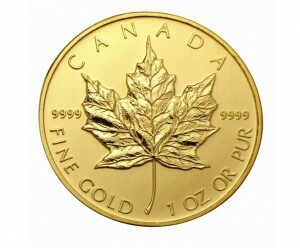 The Gold Maple Leaf was also the first gold bullion coin to be minted with 99.99% purity. 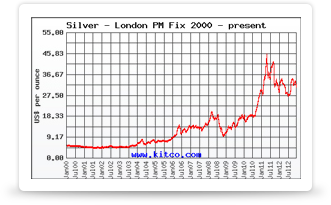 No gold coin in the world boasts a higher purity. In addition to the popular one ounce size, the Maple Leaf is also produced in a variety of fractional sizes: 1/25, 1/20, 1/10, ¼, and ½ ounce. Of these fractional sizes, the half-ounce, quarter-ounce, and tenth-ounce versions are the most common. This wide array of smaller sizes to suit any budget has made this coin popular among investors who do not have the financial means to purchase full ounces at a time. Each fractional coin is identical in design to the one-ounce Canadian Maple, except for markings indicating the face value and weight of the coin. Coins minted from 1979 to 1982 have a gold content of .999, after which point the purity increased to .9999. The Maple Leaf is considered legal tender within Canada, with face values ranging from $1 for the 1/25 ounce version to $50 for the one-ounce coin. As with all gold bullion coins, the actual market value of the coin is based on the current spot price of the gold it contains, plus a small per-coin premium. The one ounce coin measures 30mm in diameter, making it among the smaller of the one-ounce bullion coins. The obverse features the bust of Queen Elizabeth II in a design by Arnold Machin. The reverse depicts the national symbol of Canada, a Canadian Maple Leaf, along with the name of the country and the gold purity level noted in both English and French. This design has changed little since the coin’s introduction. Each year, the coin is released in both bullion and proof versions. The proof version is specially minted to feature a mirror-finish background and softly frosted, yet detailed foreground, and is highly valued by coin collectors. The Maple Leaf is also available in a number of special editions, some of which have been produced with unprecedented .99999 (99.999%) fine gold. Examples include the 1989 10th Anniversary Coin and 2004 25th Anniversary Coin, as well as various colored and hologram gold maple leaf designs. A special design Olympic Maple Leaf coin was released to commemorate the 2010 Olympic Games, held in Vancouver. Beginning In 1988, Maple Leaf coins have also been struck in platinum and silver; palladium was added in 2005. In 2007, the Royal Canadian Mint introduced a Gold Maple Leaf coin with a face value of $1 million and 99.999% pure gold. It has a 50cm diameter and weighs 100kg (200 pounds), making it the largest and purest gold coin ever minted. The Canadian Gold Maple Leaf’s unsurpassed purity and international recognition make it a wise investment for those looking to add physical gold to their portfolio. With a purity, weight, and legal tender value guaranteed by the government of Canada, gold Maple Leafs are especially sought after in North America.